Heidi's little Boy! Photos click here . they make our lives whole." 1. In a deep saute pan, heat onion and 2 TBSP of broth. Cook 5 minutes. Add garlic and more broth if necessary. Cook 1 minute. Add both cans of crushed tomatoes. Lower heat to simmer and cook for 20 minutes. 2. Cook pasta according to package instructions. When done, drain and put in a lasagna pan. 4. Add salt and pepper to tomato sauce. Pour sauce over pasta. Sprinkle mozzerella cheese over top. 5. 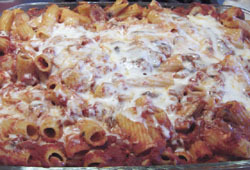 Cover with aluminum foil and cook at 350 until sauce is bubbly - about 25-30 minutes. Inhale and bring the top leg back about 1-2 feet. Bend the top knee 90 degrees. keep stability in your body. This exercise is meant to be done after part two of the series. Part 4 comes next. What does that question bring to mind for you? How can you begin to de-toxify yourself?